Our first stop is the Thermal Spring Deildartunguhver. This is Europe’s most powerful hot spring. It has a high flow rate of 180 liters/second and the water emerges at 97°C. Water is taken from Deildartunguhver to be used for central heating in the little nearby towns of Borgarnes and Akranes. 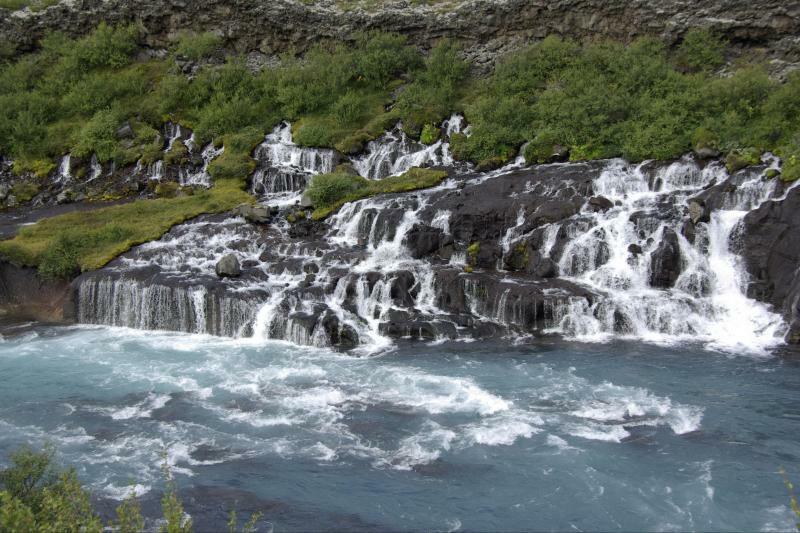 We then visit another waterfall, the picturesque Hraunfossar. Hraunfossar is a series of waterfalls formed by rivulets streaming out of the lava Hallmundarhraun, a lava field created by eruption from volcanoes next to the Langjökull glacier. We then arrive at Langjökull, the second largest glacier in Europe or Víðgelmir the longest lava cave in Iceland. Here it is optional to join a tour hosted by the company, Into the Glacier or The Cave . Our Into the Glacier tour guides will take us exploring inside a glacier. The man-made tunnel systems are about 550 meters long and go 30 meters down into the glacier. The price is 19.500 ISK. The cave tour is just shy of 1600 meters/5250ft, the cave features amazing colours and lava formations that lurk in the depths of the earth. The price is 6.500 ISK.